Madakaripura waterfall located in Sapih village, Lombang district, and it is not far from Bromo area. Madakaripura is a sacred visiting area comprising lines of waterfalls where its center reaches a height of 200 meters from the bottom. This waterfall has related historic with a great Prime Ministry, Gajah Mada, who strongly struggled to unify the whole territory of the nation under span of control of Majapahit, and said as “the last residence for Gajah Mada”. 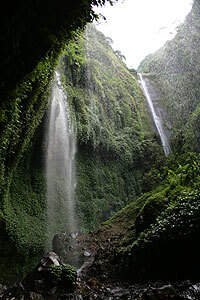 This spectacular waterfall lies hidden at the end of a deep valley in the foothills of the Tengger range. The water has cascades from the dense forest above. The primary attraction is its natural environment that is encircled by 7 waterfalls and caves. The facilities, which are available, include; parking lot, food stalls, resting place and security post. The fatigue and exhaustion one undergoes from climbing the peak of Bromo, would immediately gone after getting a bathe with the holy Tirta Sewana so to continue the travel to other visiting points in Probolinggo area.